What’s Creative About Arts and Crafts? Today’s guest post is by Faigie Kobre, who we could all learn a few things from. For whatever reason, my gmail account sorted her email into the spam folder, and I almost missed out on having her share her experience and opinions! Thankfully, Faigie didn’t give up, and reached me through a friend, and, as they say, the rest is history. Enjoy, and let us know what you think by leaving a comment. I have a pet peeve and a passion. They are connected to each other and Rivki wrote a very good post a while back addressing both of them (of course, all her posts are good, but this one is relevant to my topic). My pet peeve is copycat arts and crafts and my passion is teaching parents and teachers to move away from them. Rivki’s post was called teaching my son to be himself. In it she says, and I quote…. Many years ago there was a very well known secular singer named Harry Chapin. He wrote the song Cats in the Cradle that we all went around singing when we were teenagers. He wrote another, not so well known song called “Flowers are Red.” You can check out the song on YouTube with Harry Chapin in concert or this animated version of the song. This song is about a little boy, his creativity and how the school system/his teacher, killed it. He kept wanting to put many colors in the flowers he was drawing, but his teacher insisted that flowers are red and green leaves are green. He insisted, he got punished, he gave in. Flowers are red and green leaves are green. How common would you say that little boys’ experience is? I would say all too common. It was my experience and I’m sure many of yours. If your children are in traditional yeshiva systems, your children probably bring home the same exact projects each year (it’s not just the yeshiva system by the way, its most public schools and many private schools). Two of my children that are 10 years apart brought home the exact same project, just 10 years apart. You know what I’m talking about – Avraham’s tent and the Yom Kippur slippers? The problem is that most arts and crafts are not creative. Just because children are using crayons, scissors and glue doesn’t mean they are creative. There is nothing new created each time, probably because the adults giving the craft don’t see new, innovative creations as valuable. Value, in most adults’ eyes is: Can I recognize what this child made. Hence the oft asked question to children about their art: “What is it?” This is all regardless if the child is ready to make projects that are representational. Having children copy a project that an adult has created creates robots. If we talk about the need to teach our children to think and be independent, why is there such an output of these ridiculous copycat arts and crafts that are discouraging thinking and independence? There are a few reasons that I can see. There is a lack of knowledge of what children are capable of. Teachers and parents are not trained to understand child development and what their needs are. This leads to fear of parents. When you can’t explain why children need to create messes at the early childhood level, then you tend to do what everyone else has done because you can’t explain yourself. As Rivki said however, a child needs to express himself. But what does that mean? I was never really sure when artists spoke about expressing themselves, what that meant, but, with children I would say it means that the child is allowed to create art on his own. He is expressing his age level by creating what he is capable of at that age. To illustrate this exact point, I recently gave a project to a kindergarten class in one of the art classes I teach. It was a torn paper collage. It wasn’t just do what you want (though there is a time for that as well). The children had a clear directive. 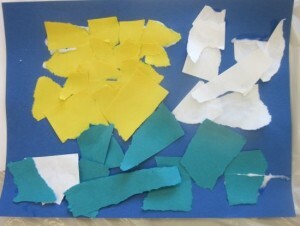 It was to be a snow picture, they could only tear the pieces they needed and could not use scissors. 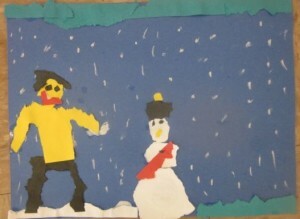 I gave them blue or black backgrounds, with a few other limited colors to create their snow scenes. Below are 2 of the art pieces of children in the same class. I admit it, I chose the two on the opposite ends of the spectrum. The first one is having problems in school. Art is often a good indication of where child is holding. If all the children have to make the same project, how in heaven’s name will we know about the ones who are in trouble? And what a pity that children who like to think and create can’t do so. They should be able to create new and valuable pieces of artwork. Yes, valuable. Not worth money though, but worth self-esteem and thinking skills. Faigie Kobre is the owner of Edu Art 4 Kids, an art website for parents and teachers teaching the best kinds of art for kids’ development. Learn the in-depth reasons that copycat art is detrimental to your children by getting Faigie’s free report The 3 types of kids crafts that suppress creativity, reduce IQ, weaken self esteem and how to avoid them. This report will help your children become better learners, increase their self-esteem and inspire amazing creativity. I really enjoyed reading this! As a school psychologist working in the public schools, I see so much of what you wrote on a daily basis! I think a major reason for the public schools doing such “rote” activities is because of the state testing at the end of each year, which lead to teachers “teaching to the test.” California recently switched to the common core standards, so we will see how that plays out…thanks for this great post! Maybe in elementary school they teach to the test, but people are still very stuck in their old traditional ways and are busy saying how they need “to teach kids to follow directions” and thats why they do these crafts. I REALLY like and agree with this post. I agree so much, in fact, that I am homeschooling my kids –though I certainly don’t think you have to be a homeschooler to work through this issue! I also wanted to point out that the crafts mentioned above in the exampled (sukkah made from popcycle sticks) aren’t creative outlets, they are “learning crafts”. A chance to have hands on experience in simulating something that was once made by someone else etc. Creative crafts are like the one you mentioned above: purely for discovering and pulling out that inner artists in us all. Something only WE can do and in our own little way. So, I think there is room for both sorts of crafts, but they can’t be confused because they hold a very different role in education. ugh sorry… typos! holding baby in my lap! Very good points here, Faige. Thanks for having her share her perspective, Rivki! I understand what you’re intention is, but I don’t understand how the same style project is a sign of the teachers’ lack of creativity. The snow project is a great idea, but does that mean the teacher can’t do the same exercise the following year because it won’t be creative? Or are you saying that the projects you got were completely identical? Most teachers that I know have a concept they want to make but the children have the freedom to customize as they want, similar to the snow picture. There are guidelines, but ultimately it’s a task of self-expression within those guidelines. I definitely agree, though, that students asked to copy a teacher’s work is not a way to demonstrate or encourage creativity. There is a time and a place for copying, but not all the time. I used to do two “copy this project” projects per year with my 2-3 year olds as assessments on following directions, color and shape recognition, and spacial awareness. But I did each project one on one with the kids. I just don’t see teachers having children copy as often as people think. Most teachers I know start with a bare concept and the kids help design their own with their personal preferences. Yes, you can clearly tell which projects the teachers “fixed” or “helped” the students do “right” but most of the projects I get have my daughters definitive markings and signature color coding (one likes purple/pink, the other likes yellow/orange, these are the only 2 color combinations we ever get on projects from school). In my own classroom, my only rule is “do your best work”. I love it when the kids decide how to do the project, and when we work together to design bulletin boards. I keep a variety of art media materials in the classroom and the children are encouraged to find interesting uses for them. They have the most amazing ideas! Penina, I meant when the childrens pieces look exactly alike. All like their friends and the same each year. Of course, there is nothing wrong with doing art over and over again if its open ended enough. I’m not sure what you mean by you don’t see children copying often. Most of the classes in my neighborhood and the schools that I know of in many frum areas have schools that do what I call copycat arts and crafts. My point is that art should be something that helps kids to think and be creative on their age level. If the idea is the teachers, then the child is not being creative, she is copying what is not an age appropriate activity. Every art activity has to have choice built into to be creative, and not only what color crayon they should use to color the project. I like your point. Music is special (am I biased as a music therapist??) in that it accesses both parts of the brain according to studies. The left and the right. We need structure in music or we have chaos. We need rules and theory and everything that is the basis of a beautiful song. Music has a beginning, middle and end. However, there is the side to music where everyone gets to relate on his or her own way. I think the aspect of individuality in music – as would be similar to faigies and rivki’s original point in her post – would be if one played a song for a child and then had each child write a thought on the music. Slightly off topic, but maybe not? I’m researching creativity & Alzheimers and what’s been astounding to learn is that a person’s creative ability is incredibly resilient and can be brought out in any number of ways. The difficulty for me has been that I’ve deemed what is creative by thinking that creativity looks like something specific, or is something I can relate to somehow. But creativity should not need to mean anything to anybody other than the creator. Whilst some people may need assistance getting started once they do, there is joy in the process, whatever the outcome, and perhaps that underlying concept is what should be being taught. Marla that is actually the case for when kids start learning to draw. Because of my progressive ed background I had a very hard time wrapping my head around kids “learning” to draw. Until I read Mona Brook’s book Drawing with Children. In it she teaches a method for children to learn how to draw that does teach kids to copy. She helped bust some myths for me (and I am actually working on a course to teach parents and teachers who are not creative how to teach their kids to draw and do art) and learn that sometimes one needs to follow certain rules to learn and that can lead to creativity. That however, is not what crafts is all about. Crafts is what teachers and parents do with their kids to keep them busy and supposedly to let them be creative. Unless you are using crafts to actually learn a craft (like adults do) and then be creative in creating with that craft. Otherwise its petty much a dead end activity.Drawing is not. Especially if you learn what to do with the drawing and learn how to create art with the skills you develop. Its true Joanne that there are many different areas that people can be creative, but when people hear the word creativity they automatically think of art related things. I’ve never really thought about this, but most of what my kids bring home in terms of art is exactly like what you described – copies of whatever the teacher was instructing, each kids’ being almost identical to the other. A good reminder to let them do some projects completely on their own at home! I remember in (public) high school, we had to read Lord of the Flies. I was the only person in the whole class who interpreted the ending differently than everyone else, and I was told that I was just wrong. I was extremely frustrated. Why? I wouldn’t have cared – this was just some fictional story anyway. But as a very left-brained student who could sit there and add up numbers by hand for hours and who thrived on the iron-clad rules of grammar, literature classes had always been among my least favorite. It took me years to figure out what those “What do you think the author meant?” questions. I always wanted to say, “What am I, a mind-reader? Ask the author! !” Once I finally decided to humor the Literature Establishment and try to take those questions seriously by “thinking creatively”, I was wrong – no, that’s not what happened in the story.